In the past few weeks, two of New Zealand’s icons confronted their own mortality. One crossed over from player to retiree and another crossed over, sadly, from mortality to immortality. Martin Crowe left the world on March 3rd, 2016. 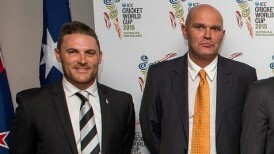 Brendon McCullum left the game of cricket poorer with his retirement on February 22nd, 2016. The living constantly build edifices to confront their own mortality – books, photographs, trust funds and plaques to name a few. Cricketers build edifices with the memories they leave behind. When Martin Crowe led his team of underdogs in World Cup ’92, I was all of 7. Too young to understand the nuances of the game, I only knew New Zealand were on a winning streak. I woke up one bleary eyed morning and my mother told me New Zealand had lost, the sight of their grey jerseys is still vividly entrenched in my memory. Then they lost to Pakistan. Once. Then twice. And the team left the field in tears, their joyride having come to an end. Some 16 years later, when I began to follow the game and write about it, I began to connect some of the dots. Martin Crowe and Brendon McCullum helped me do that. In the last few years, Brendon McCullum pissed me off a couple of times. April 2008: It’s the inaugural match of the IPL and it’s being played between the Royal Challengers Bengaluru (my city) and the Kolkata Night Riders. Bangalore is captained by one of my heroes and role models, Rahul Dravid. McCullum set the tone for the Indian Premier League by smashing an unbeaten 158 runs off 73 balls to hand Bangalore a crushing defeat on their home ground. March 2015: It’s the World Cup final and everyone other than the Aussies are rooting for a New Zealand side that showed the world what ‘spirit of cricket’ meant. Mitchell Starc comes thundering down and Brendon McCullum gives him the charge in the very first over. Brendon McCullum gets bowled. New Zealand crash and burn to hand the foul-mouthed Aussies their 5th World Cup victory. Baz reminded me of a biker who has a soft corner for puppies. While mental disintegration became the buzz word for cricketers after the Aussies marketed it like it were some elixir for victory, McCullum was content disintegrating bowlers figures without resorting to verbal battles. With his broad shoulders and tattoo studio arms, he showed the world that cricket can bring joy to the viewer when played in the right spirit. In his final Test match, he smashed the fastest Test century to give his fans an abiding memory to live with. Remember Grant Elliot putting his arms around Dale Steyn after the heartbreaking semi-final in the World Cup? To me, that was the enduring image of the tournament. Contrast that to Brad Haddin giving players an earful in the finals. His reason? The New Zealanders were too nice for his liking. We live in angry times when a presidential hopeful spews venom and leads the polls for his party. Angry is in, cool, and this is being reflected in cricket. But McCullum’s men showed that victory and defeat can be lifted by grace, a virtue that many young cricketers need to look up in the dictionary before they can get to comprehending its meaning. He may have been running out of time, but he didn’t run out of words to tug at our heart strings and make us sob like little boys. Martin Crowe didn’t live to see his side win the World Cup but he gave us enough memories to last a life time. All goodbyes aren’t unequivocal. Some are hard, some cold and some indifferent. Baz and Marty said two very different goodbyes. The memories they left behind are rich, their lives an inspiration to future generations. That they filled our days with a joy that is hard to describe makes saying goodbye that much harder.